I enjoy thinking about ways to enlighten children about the joys of math and science. Sometimes I’ll extrapolate from memories of my own childhood to create new ideas. I’m happy to report that I came up with an idea for a cool new variation of the popular outdoor children’s game hopscotch - all the kids enjoyed hopscotch around my neighborhood when I was growing up. 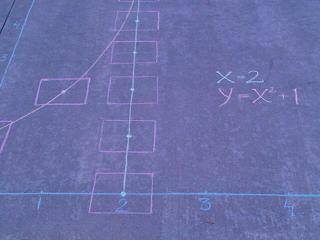 My idea is to morph hopscotch into a mathematical learning game. I envision something I call Cartesian Hopscotch™ . Unlike the ubiquitous double-cross squares of traditional hopscotch, the new version is based on Cartesian coordinates graphed for two (or possibly more) simple algebraic equations. 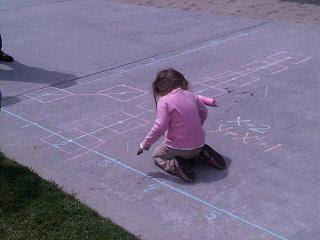 (see SLB's new assistant Astrid from Austria hard at work making a Cartesian Hopscotch creation at a local children's playground). All you do is plot the two equations on a large X-Y graph carefully drawn on the ground and the resulting points become the new squares of the Cartesian Hopscotch court. Of course the process may require some trial and error in the beginning to come up with viable hopscotch configurations, but it will be a valuable learning experience for the child nevertheless. One good thing about Cartesian Hopscotch is that it offers the kids the opportunity to play on a new court whenever desired, just pick new equations. For convenience, I envision a large permanently painted area with an empty X-Y graph on a concrete area in the backyard (maybe you can get your local school playground to do the same). Then the kids can use some large outdoor colored chalk to plot the equations. It’s also a fun family activity, parents included, to come up with interesting plots and twister-like hopping gyrations for the kids to enjoy. Imagine what your neighbors will say once the word gets out that your house has this exotic new game for all the kids to enjoy! This is a super idea. I spent this m orning painting a grid out in my yard for my 6 yo and his friend nextdoor. they started with y=2 and y=1/2x + 2. Ok, I helped them but they had fun. thanx for the idea! ! OK, this caught my attention. I will give it a try at the school where I teach to see how it flies. Good idea. I will contact you about marketing this idea. I work for a kids game company and we've been searching for something with educational value. Good idea, never seen anything like it, catchy name too.